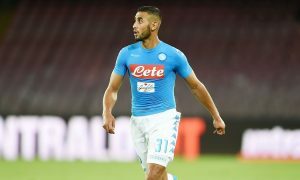 Manchester City and Pep Guardiola’s interest in Napoli left-back Faouzi Ghoulam is well reported, with the 26-year-old Algerian on the radar of the Premier League club as they consider options to replace long-term absentee Benjamin Mendy in January. Ghoulam is out of contract in the summer, but Napoli, who visit the Etihad tomorrow for their Champions League tie with the Blues, would reportedly rather lose him for free than cash in on him in January. And they may not have to succumb to either fate yet, with Rai Sport reporting that the Italian club are making progress in negotiations to renew Ghoulam’s deal, and are willing to offer him more than €3million a season to stay at the Stadio San Paolo. Super-agent Jorge Mendes has been involved in contract talks, but Ghoulam’s brother and formal agent, Samir, could yet have an influence. That is because he is personally said to be ‘fascinated’ by the interest of Pep Guardiola, who may look to add a second natural left-back to his squad, despite the impressive form of England international Fabian Delph as a makeshift full-back. The list of left-backs linked with a switch to the Etihad is growing, with Ghoulam joined by Ryan Bertrand (Southampton), Aarón Martin (Espanyol) and José Luis Gayà (Valencia) on the rumour mill. It isn’t even clear yet if Guardiola will add a new left-back in January, but if City hope to compete on all fronts this season, there are some risks in having no natural left-backs in the squad with Mendy sidelined until around April.